• Using an Excimer lamp the aerosol flow is exposed to UV radiation. The Excimer lamp offers a high intensity, narrowband source of UV radiation. The wavelength of the light is chosen such that only the carbon aerosols are ionized, while gas molecules and non-carbon aerosols remain neutral. • The carbon aerosol particles emit electrons, which are subsequently removed when an electric field is applied. • The remaining positively charged particles are collected on a filter inside an electrometer, where the charge is measured. The resulting electric current establishes a signal, which is proportional to the concentration of Elemental Carbon and/ or PAH. 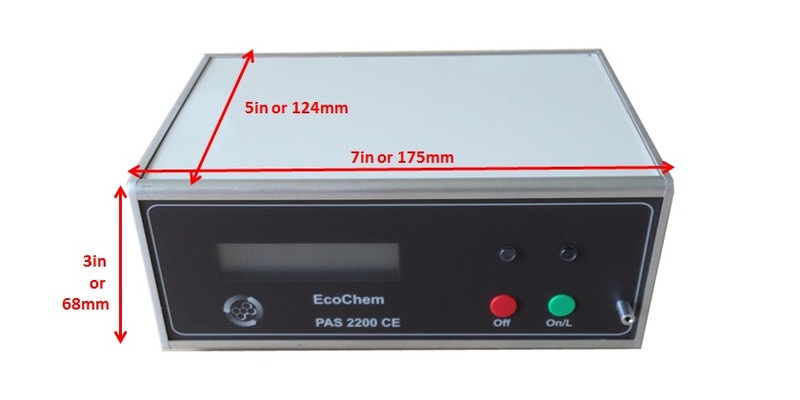 Also by operating the Excimer lamp in a chopped mode, the PAS 2000 can eliminate the background signal, which is associated with freshly generated aerosols. The chopped mode also enables a dynamic zero to be generated automatically by the instrument. Source-specific calibration curves are available or can be generated where the monitor output is compared to an analytically determined EC and PAH concentration. A site-specific calibration curve can provide greater accuracy for the particle size, charge and compound-specific to the source. In addition to the site-specific curves, an approximate universal calibration curve can be used for screening and real-time trending applications. Power: 115 volts AC / 60 Hz & 220 volts AC / 50 HzMax.